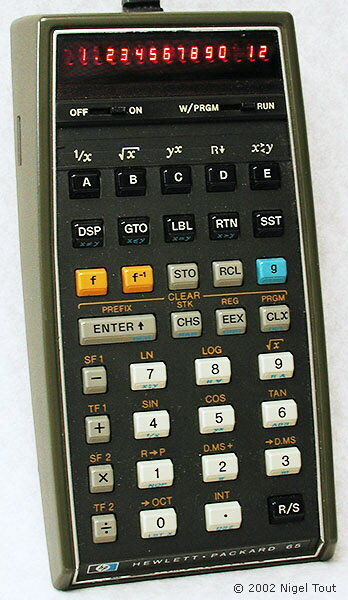 Distinctive features: The first hand-held, programmable calculator. Scientific, programmable, with 100 program steps. 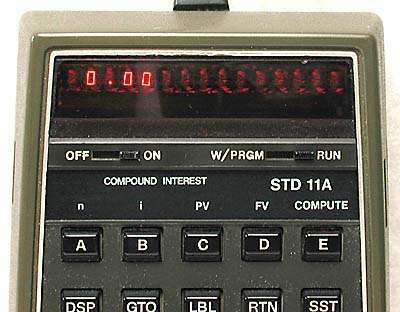 This was the first hand-held programmable calculator. Programs can be stored on magnetic cards, see photographs below, though these had been used previously with desktop programmable calculators. Program libraries for performing calculations for various disciplines could be purchased from HP. Above, "Compound Interest" program about to be read from the magnetic card. The card is driven through the calculator by a tiny motor inside, from right to left. 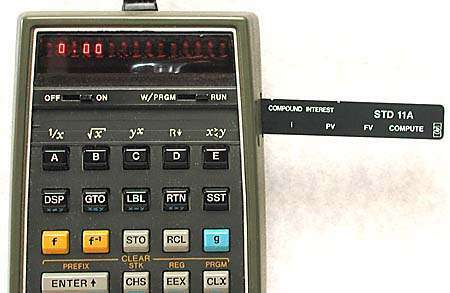 Left, after the program has been read in, the card is inserted in a slot below the display and there provides the legends for the keys A to E.
There is an enormous amount of information about the HP-65 gathered by David Hicks at the Museum of HP Calculators at http://www.hpmuseum.org/hp65.htm.